Today is "Show & Tell Sunday" and Analise and Cerri have asked us to show off our millinery flowers. 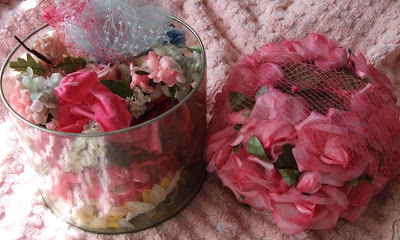 I haven't been collecting vintage millinery flowers for very long, but I love them! So, on with my own little personal "flower show." 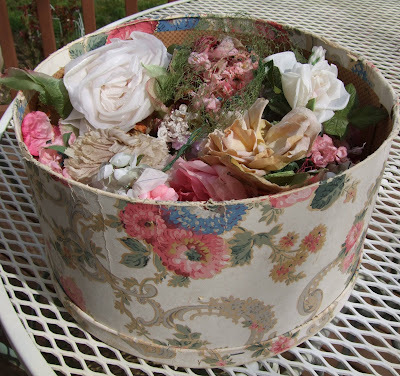 A lot of my favorite flowers live here in one of my vintage hat boxes. I got this peachy pink velvet box from Isabel and I had the perfect flowers for it. 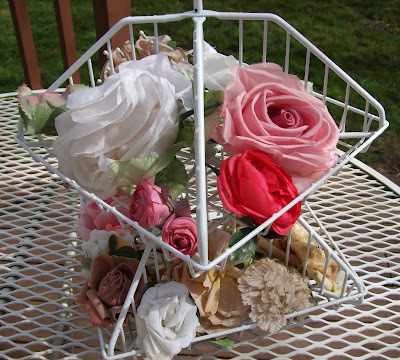 Some flowers on my new revolving rack. Vintage hat and flowers found at the last Portland Antique Expo. This box holds a few special things destined for the inspiration board I plan to make. One of my favorite Monticello finds. 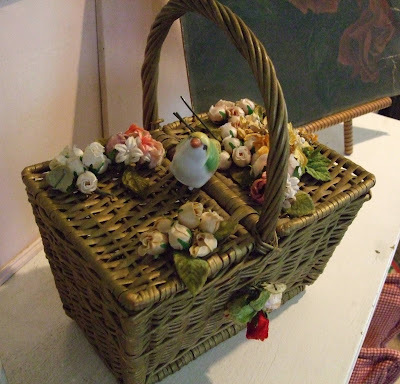 A vintage basket with millinery already attached. 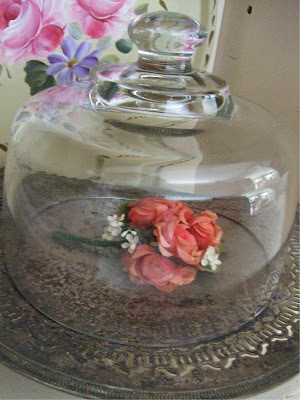 Here are a few ways I use vintage millinery in decorating my home. 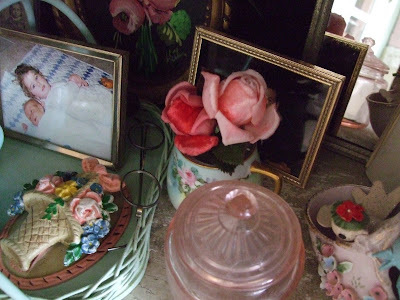 My Grandma Pressley's vintage hats displayed in my bedroom. 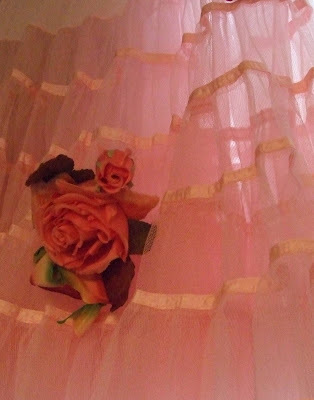 On a pretty pink crinoline hanging in my sewing room. On a silver tray, under a glass dome on a bookshelf in my living room. 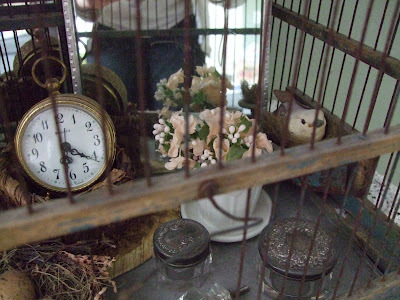 In a bird cage with other pretties. In a cabinet with some other special treasures. 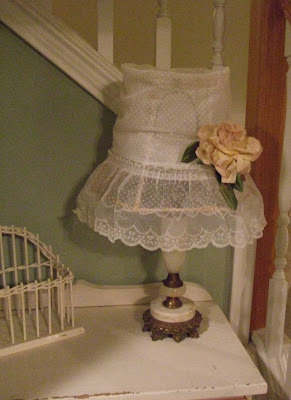 On a vintage lamp in my entry. I hope you enjoyed my "flower show today. 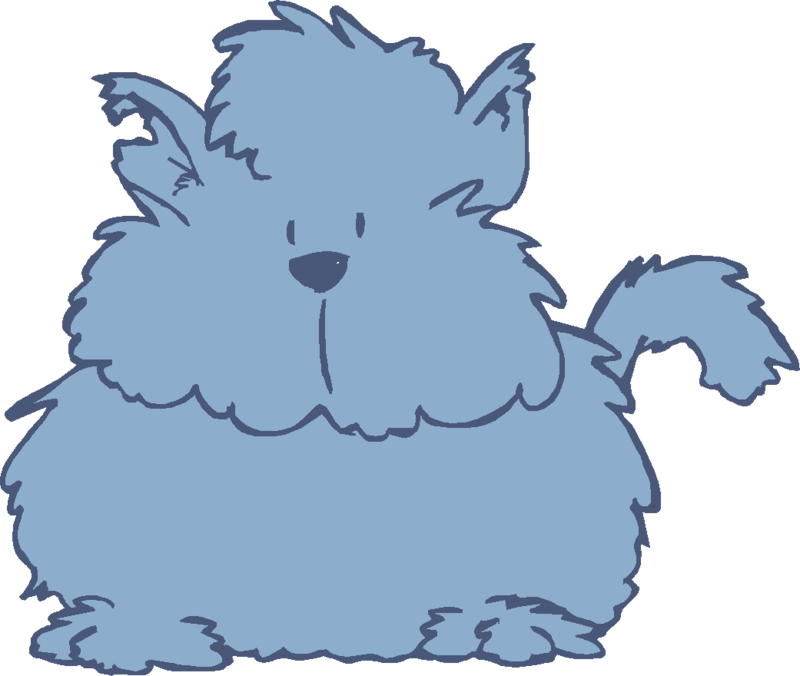 Please make sure to check out Analise and Cerri's blogs for a list of other blogs who are participating in Show & Tell Sunday. Going to the the flea market with Isabel this morning, so I'd better boogie! Have an awesome day! Lisa I love your millinery collection! That velvet box is amazing!!! Have fun at the flea market today!! Ok, so for not collecting for very long, you have an impressive collection! Your vignettes are so pretty. You always show something I want. I gotta find me an old basket purse with millinery on it now... Beautiful stuff!! 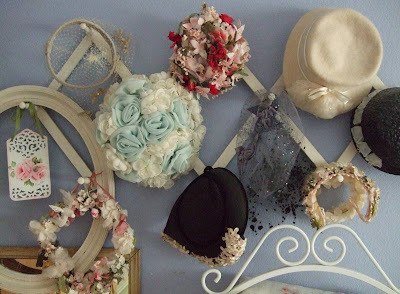 What a wonderful selection of flowers and great idea for displaying the hats. Thanks for sharing your terrific collection! I love your hatbox too! And those hats that once belonged to your grandma look gorgeous on that rack, I like that picture. Quite different from the hats my grandma wore. Love your collection! Your Grandma's hat collection is so very beautiful. I love the blue and white one. Very soft and romantic looking. Your flower pics have been very inspiring today. Thank you. Beautiful! I love the way you have them displayed in your home. I'm really going to have to keep my eye out for more hats now! I enjoyed your "flower show" very much! So glad you shared. Your collection is so beautiful! I really love the pink velvet box! YUM!! Well, all of your flowers are just gorgeous!! I love your collection! Your Grandma's hats are just darling too! I also love the way you decorate around your house with them! So pretty! 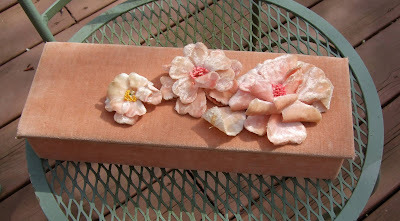 What fun that you have your beautiful flowers scattered around your home--making everything just a little bit prettier! That blue and white flowery concoction is just fantabulous! Wow! What a collection. I love that you display them throughout your home. Wow Lisa, now I love those...I wish I had to shop to show off pretties...course I couldn't sell them...I tried to count your roses, but it is impossible! Such pretty displays with the flowers! I especially like the glass dome and the bird cage. Very pretty collection! Your house looks pretty too! Oh I love that peachy velvet box and that sweet lamp by your entry!!! I haven't been collected millinery very long either. You have a great collection though! 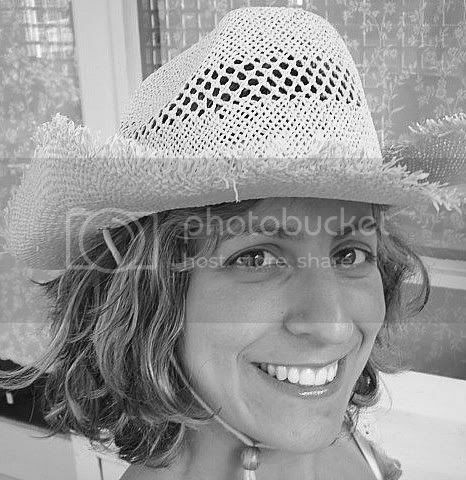 Love your millinery flowers Lisa!!! You have such a pretty collection. 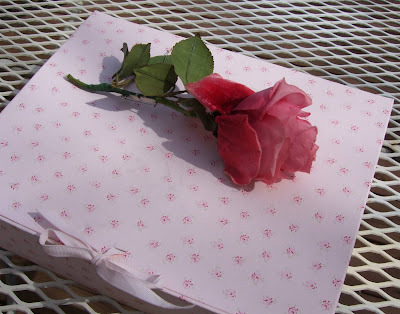 :)) Hope you had a great day at the flea market. I love the velvet box, it is so pretty. I really like how you have your grandma's hats displayed in your room. 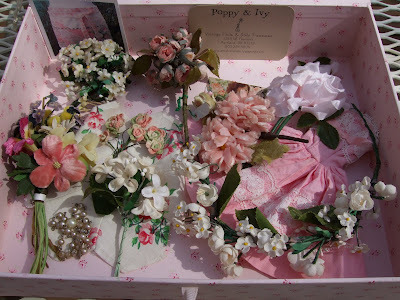 DROOLING over your fab millinery collection - what a treasure trove Lisa! I like the ones destined for the inspiration board...come grab me when you show it! I think your collection is just wonderful. 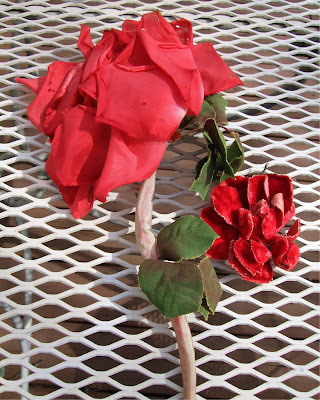 I've just begun collecting millinery flowers, I don't see many. I enjoyed the show!! What a fabulous collection!! Your grandma's hats are beautifully displayed! Love the lamp too. wow, you have the prettiest collection i have seen. you must have been collecting for forever! Oh I adore your millenery collection *sigh! Looks like I live in the wrong country, cause I can't seem to find them here, so my post looks really sad compared to yours. Loved your botton collection too!